The nose is a complex component of the facial anatomy that is comprised of numerous structures. Here we will go from top to bottom and describe each of the components. The surface of the human nose consists of a frontal portion comprised of the glabella, nasion, alar sidewalls and tip points; a basal portion made up of the columella, nostrils, soft tissues and infra tip lobule; and two other portions called the latter and oblique sections. The internal structure of the nose, namely its cartilage and bone structure, is responsible for the physical/ visible characteristics of the nose. The bony portion of the nose only makes up the upper third of the nose bridge. Physically, it is responsible for the height of the nose. It provides the support for the upper portion of the nose. The entire nasal cavity is lined with a mucosal surface made up of epithelial cells and glands that produce mucus. This mucus keeps the inside of the nose moist, traps allergens and other particles and helps keep the air you breathe in humid. Millions of cilia continually move the mucus layer across the mucosal surface, pushing harmful particles out of the nose in the process. In this sense, the nose is an air filter that purifies air before it reaches the lungs. Figure 3. Frontal view, anatomy of the nose. At the very top of the nasal anatomy is the nasopharanx, which contains lymphoid tissue known as the adenoids. In addition to meeting with the nose, the nasopharanx is also connected to the ears via the Eustachian tubes. An area called the choana links the nasopharanx to the left and right portions of the nasal cavity, which is the space above the oral cavity and hard palate. Located below the skull base and intracranial compartment, it is divided by the septum. The septum is comprised of bone in the back and cartilage in the middle and front portions. The bony part, which is immovable, is made of up the perpendicular maxilla bone, the vomer bone and the ethmoid bone. The septal cartilage, which is moveable, is surrounded by another section of cartilage called the lateral nasal cartilage. The lateral nasal walls, or sidewalls, each contain three finger-like structures called turbinates. These are made of bony core covered with soft tissue and mucosa. The turbinates regulate nasal airflow and provide mucosa surface area. The largest turbinate is called the inferior turbinate. It is located along the whole length of the nasal sidewall, next to the nasal floor. The middle turbinate is located next to the septum and extends into the central nasal cavity. It is attached to the sidewall at the back, right above the inferior turbinate. The smallest of the three turbinates is called the superior turbinate. It is located above and behind the middle turbinate and attaches to the skull base and nasal wall. Below the septal cartilage is the greater alar cartilage, which forms the lateral and medial walls of the nostrils, and below this are four lesser alar cartilages. Together, the greater alar cartilage and the lesser alar cartilages give your tip and nostrils their shape. Figure 5. Determinants for the shape of the nose. Near the tip of the nose are the nostrils and the columella – the strip of skin between the nostrils. The portion of the nostrils that attach to the cheeks is called the alae. Your nose also has four types of muscles called elevators, depressors, compressors and dilators. They are connected by a structure called the nasal superficial masculoaponeurotic system. 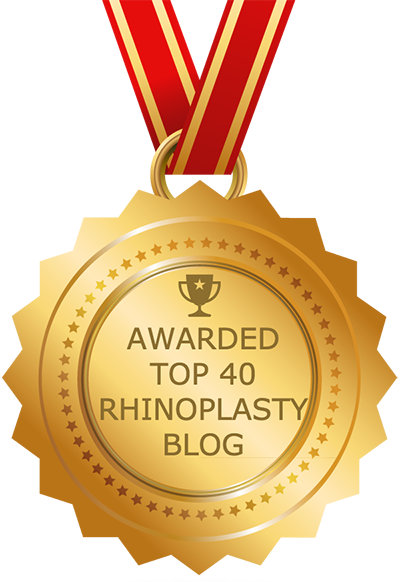 Rhinoplasty involves manipulating, shaving, adding to and/or otherwise altering the structures of the nose. Figure 5 shows the basic components of the nose that are altered during rhinoplasty procedures. Bone – The bone cane be carefully and minimally shaved down to lower the height of the nasal bridge. Cartilage – The cartilage is the most altered part of the nose in rhinoplasties. To decrease the size of the nose in any specific area, cartilage can be strategically sutured without sacrificing the support structure. To increase the size of the nose or provide more structural support, grafts can be made from existing cartilage in the patient’s nasal septum, the ear, or rib cage. Nostrils – The nostrils can be made smaller by making an incision right along the alar base and bringing the width inwards. Skin – Thick nasal skin is reduced by thinning the fatty tissue underneath the skin. To learn more about the anatomy of the nose, contact my office today.